That's Vegetarian?! : Quick Meal That Feels Like Dessert! Chia seed, your choice of milk and flavoring. Let it sit overnight. Chia seeds have been a staple in countries for centuries. For many of us it is a new super food like quinoa. The Mayans and Aztecs knew what they were doing! 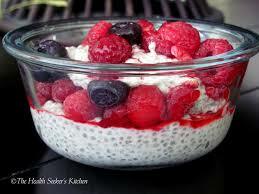 Chia seeds are high in Omega 3's, minerals, fiber, and antioxidants. They are seeds, so they have fat but the good kind since it is from a vegetable source. The fiber helps with a feeling of satiety - ability of food to satisfy.They are high in calcium, manganese, and phosphorus. The outer shell of the chia seed swells, absorbing the liquid in the milk creating a pudding like texture. They are also a great replacement for eggs in recipes like flax seed but the advantage is chia seeds don't need to be ground. Chia seed pudding is a quick and easy dessert to make that is full of the health benefits listed above. It is versatile as you can choose the flavoring you want to suit your mood. I like making it in individual containers but you can just put in one big one and serve. I don't use any sweetener and then feel less guilty when it is a meal replacement. Adding fresh fruit or a dollop of preserves on the top can also add sweetness to the pudding. Share your favorite add-ins on That’s Vegetarian’s Blog. Mix the ingredients together well. Put in one large container and let it set in the fridge for 4 hours or overnight. Optional - add 3T cocoa powder to make it a chocolate pudding!